The headline on the press release resulted in raised eyebrows: "survey says a sense of humor is an important part of company culture." Really? Even in this day and age of hyper-sensitivity, when any innocent attempt at humor in the office could cause offense to someone, somewhere? But a new survey by Accountemps found that 78% of chief financial officers believe an employee's sense of humor is at least some contributing factor to his or her success. When asked, 22% said it was very important while 56% of CFOs rated it as somewhat important. 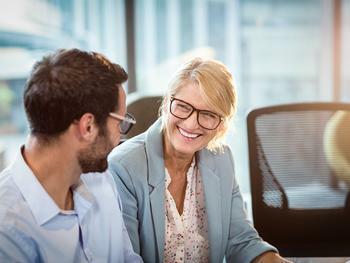 "A sense of humor can boost moods and improve connections among colleagues," said Mike Steinitz, executive director of Accountemps. "Creating a positive and friendly work environment can lead to higher levels of employee engagement and productivity." Maybe, but don't mistake your office for open mic night at the Improv. In the age of political correctness, humor is in the ear and sensitivity of the listener. "The problem, most would say, is that humor is subjective: What you find amusing or side-splittingly hilarious, Mary in marketing and Amir in accounting most certainly do not," writes Alison Beard, in the Harvard Business Review. But Beard notes there is a growing body of research suggesting humor in the workplace is worth the risk -- that a good belly laugh once in a while or a playful pun does wonders for productivity and morale. Indeed, a Google search of "humor at work" reveals dozens of articles suggesting that people who are funny on the job tend to get ahead. There weren't all that many warning of the pitfalls, of which there are undoubtedly many. "Not all business matters are funny, but a little levity can go a long way, particularly when it comes to defusing tension or recovering from a minor mishap," Steinitz said. "There's nothing like a joke to put people at ease." But Steinitz offers a few rules for workplace humor to keep you out of trouble. First, consider the circumstances. A chuckle might diffuse a tense situation but cracking a series of one-liners during a serious business meeting will be frowned upon. Be careful where you express your humor. Emails and instant messages are dicey, since they are subject to misinterpretation. They're also permanent. Self-deprecating humor is always safer. Getting a laugh at someone else's expense never works out well, as George Costanza learned in this scene from Seinfeld. Finally, keep it G-rated. Anything off-color is bound to offend someone, and will probably result in a meeting with HR. When in doubt, save the material for open mic night at the Improv.